I’ve been meaning to write about this for quite some time. In my opinion this has the potential to really rock the boat for multi-language, multi-country SEO. In fact had this feature rolled out fully last year it would have been high on my personal ‘Top SEO Stories of 2007′. It is the new Geotargeting function within Google Webmaster Console. 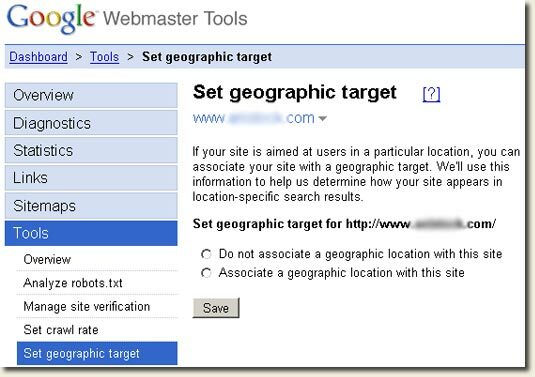 What is Geo Targeting within Google Webmaster Tools? So whereas before you had to either use ccTLD or server IP location to inform Google of your preferred country level index, now both of these requirements have become redundant. MC:Yeah, we definitely hear, especially big sites that have lots of presence in different countries, but all on one domain – it’s a huge help, because there really wasn’t a solution for that before and now they have a good alternative. But they neglected to mention one very important issue with the new Geo Targeting tool. At PubCon Google hosted a ‘Meet The Engineers’ event. I managed to track down not one, not two, but three individuals who work directly on Google Webmaster Tools. I mentioned the bug reports I’ve left on the Google Groups, and mentioned that the tool didn’t seem to be functioning as promoted. The response? Depending on who I spoke to the tool was either ‘slightly’ broken or ‘really’ broken. And I think this fact is borne out by the complete lack of chatter from people who’ve successfully benefited from the Geo Targeting tool. Of course no official proclamation on this from Google as of yet. I fully believe that this tool will become fully operational, and when it does it will have profound affects on many organic niches, most especially so in Google’s country level search properties. I’m pretty sure that this tool will become immensely important. I’m going to put together a small tutorial that explains both who can use the Geo Targeting function (it’s not available to everyone), and how to use the tool to best effect on your site. If you’re interested in this tutorial you can sign up to my feed and be alerted as soon as it’s published. Hmm – interesting stuff. Can you expand a little bit on how it’s broken? Does it flat out not work or are there just some issues? I was also very excited about the launch of this tool when it came out (as was any SEO outside of the US I think!) but I’ve yet to properly test it. Do you think changing it while the tool is still ‘broken’ could have any negative impact? Catch me on email if you don’t want to chat here. I’d be interested in that tutorial alright. How will we know it safe to use it and that it is “fixed”? Hope it’s not long! I’ll keep an eye out for the tutorial. Thanks for the info. Broken as in not having the desired effect. I’ve heard isolated reports of the tool working when you change the geo target of the root domain. But in my experience geo targeting either sub-domains or sub-folders has had zero effect. There are also some reports of this damaging rankings, but these are very unconfirmed. I think the advice I’d give currently to anyone looking at using the tool is to ‘wait and see’. I’m sure they’ll crack it, but currently it’s not having the desired outcome at all. I tried it and swear that it damaged my site’s rankings. I would urge everyone NOT to use it. What’s also strange is that I can now no longer edit what I’d previously entered into this tool. ccTLD or server IP location to inform Google of your preferred country level index, now both of these requirements have become redundant. @ David – I’ll pop up a detailed tutorial and tips post in the next few days. @Roberto – if you want to discuss this off record please drop me a mail info [at] redcardinal dot ie. I’d be interested to hear more about this. I’m very interested to hear your thoughts on how this tool can be correctly used. There are going to be many concerns with duplicated content with the delivery of multi-language sites, especially those with user generated content. Do you think Google are going to improve the manner in which they filter duplicated content and maybe provide a way for webmasters to select which is the preferred language of the content when accessed by a user from a specific country/IP/referrer/browser language..
Any news on that tutorial, Richard? Richard – Just for the record, have seen some good results using the GEO targeting tool. Has taken around 5 months. Thanks for that. I’ve worked on a number of multi-territory sites now using this tool, and I’ve seen the results myself first-hand. Just looking now, and it seems like I really should write up a post about how I’ve ued the tool, and some of the experiences I’ve had. Have decided to take the plunge on translating the site. The improvenment in UK SERP’s has given me the nudge. Just wondered what you would recommend in terms of sub domains or sub folders. The site is being translated into German/Frech/ Italian/Spanish. Duplicate content shouldn’t be a problem. It all depends on your site TBH. In general I’d probably go with sub-folders, unless your site has a lot of authority to pass to sub-domains. Best of luck with it – I reckon you’ll get a good return on this if you get it right.